Here's a list of the talks I'm currently doing. 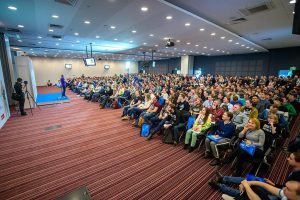 There's a wide variety of topics, styles, and material used, from inspirational keynotes to tech talks with lots of code. The world is changing fast. More precisely, the world is changing at increasing speed. This means things that were not possible five years ago come into reach. Incumbent organizations need to adapt fast to keep up with new competitors that use new technologies easier, faster and better than they do. As a result, every aspect of software changes towards smaller. Even smaller teams or even micro-teams, less management, flatter organizations, even shorter cycles, and smaller components. During this energizing and high-paced talk Sander discusses the Cynefin model, shows why software development goes so terribly wrong, how to move beyond Scrum and enterprise agile, why self-organization is not as easy as it looks like, why continuous delivery leads to not doing projects or estimates anymore and why microservices are hard but essential as underlying foundation. Our world changes at increasing speed. Things that weren’t possible 5 years ago come into reach. Incumbents need to adapt to match start-ups. We evolve towards smaller, faster, shorter. Smaller teams or even micro-teams, flat organizations, no management, even shorter cycles, smaller components. 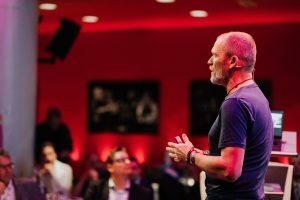 During this inspiring talk, Sander discusses Cynefin, how development goes wrong, how to go beyond Scrum, why self-organization is hard, why continuous delivery allows you to stop doing projects. Codemotion Rome 2019 (opening keynote). The attendees' results rated your talk as 99% "Good", 0% "Neutral" and 1% "Bad". This talk serves and has served well as an inspirational (opening) keynote. Over the years the way projects and teams operate in software development has changed quite a bit. From projects were teams were sliced vertically per discipline, to multi-disciplinary and cross-functional teams in agile approaches and frameworks. Now, as a consequence of increasing velocity, DevOps, DevSecOps and continuous delivery, we are on the move again. In Sander's vision, teams that will be even smaller than in agile, and much more fluent. Microservices are all the hype. Websites are full of posts, books are being written and conferences organized. There are big promises of scalability and flexibility. However, when you are knee deep in mud as an architect, developer or tester, it’s hard to find out how to get there. Sander Hoogendoorn, independent craftsman and chief architect at Quby (makers of Toon), discusses the long and winding road his recent clients and projects, both greenfield and brownfield, have traveled towards microservices and continuous delivery. Sander addresses lessons learned about polyglot persistence, domain driven design, bounded contexts, being RESTful, doing API design, continuous delivery, build pipelines, automated testing, and security, illustrated with many real-life examples from several of his diverse clients. Microservices have been around since a few years, and many organizations are starting to benefit from these autonomous, independently deployable and easy maintainable small blocks of code. However, if you examine some of the popular definitions of microservices, we are still building a single application as a suite of small services. During this talk, Sander Hoogendoorn will explain and demonstrate how front-end development can also benefit from building it in small autonomous, independently deployable blocks of code, instead of implementing a single monolithic web application. Of course, Sander will use many code examples in Java, Angular and Typescript (and probably some live coding) to illustrate even better how to build micro-applications similar to your microservices. Microservices have been around for a few years. Many organizations benefit from these autonomous, independently deployable and easy maintainable blocks of code. However, in most projects, we still build a single application on top of these services. This talk demonstrates how front-end development can also benefit from building in small autonomous, independently deployable micro-apps, instead of building a single monolithic web application. With many code examples in Angular and Typescript. 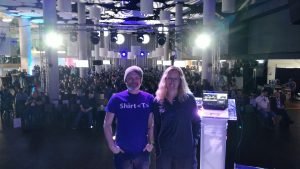 Codemotion Amsterdam 2019. The attendees' results rated your talk as 90% "Good", 10% "Neutral" and 0% "Bad". Nice front-end technical talk with code examples and possibly live coding in Angular and Typescript. One of the great things about being a programmer is that you never stop learning. Even after having programmed for almost 35 years, I still improve on the way I write code. Recently the way I write code changed once again when I started to apply monads and especially the Try class. During a recent project, my team created a small library that ports the behavior of the Scala Try monad. Although at first, this new monad didn't appeal to me, I soon really started to appreciate this style of programming, where we concatenate series of Map() and FlatMap() methods, using lambda’s, and avoiding abundant try-catch blocks, and many if statements and null checks. In the meantime, I have contaminated many programmers with this style. Developers make it a sport to always start every method with a return statement. During this talk I’ll discuss lambda’s, closures and monads, and demonstrate the power of this simple monad, using many code examples (in Java, C#, and TypeScript). Don't hesitate to join in. As a programmer, you never stop learning. Recently the way I code changed dramatically when I consciously started to apply monads, starting with a port of Scala’s powerful Try monad. During this talk I’ll discuss lambda’s, closures and monads, and build of a simple Maybe monad, demonstrating the power of monads, using many code examples (in Java, C# and TypeScript). Don't hesitate to join in. Ever since we started writing code in the fifties of the previous century, managers and project managers have tried to discipline and structure the way we work. However, no matter how many consultants and coaches are hired to implement increasingly complex process frameworks and methodologies, developers and testers always come up with new simplistic approaches. During this talk, Kim and Sander will feal with Flow: the worst software development methodology in the history ever, taking inspiration from the worst principles and practices from methodologies such as waterfall, RUP, Scrum, Kanban, Lean, BDD, LeSS , SAFe, Spotify and of course everything continuous. Don't let project failure take you by surprise, be certain! With microservices and serverless are the current hypes, there are big promises of scalability, replaceability and flexibility. However, when you are knee deep in mud as an architect, (front-end) developer or tester, it’s not always easy to see how. 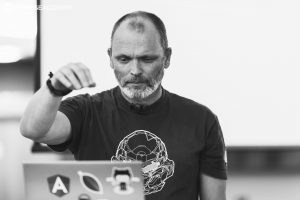 At recent client, in his role of CTO, Sander Hoogendoorn has created landscapes of small microservices, that deliver on the promises above, with architectures based on the patterns from domain driven design. Moreover, these landscapes also feature many micro-applications, which are also based on the domain driven design patterns, that also deliver on the promises of microservices. During this talk, Sander Hoogendoorn, independent craftsman and Director for agile product-oriented consultancy 101 Ways, discusses the set of patterns such as resources, representations, repositories, entities, value objects and factories that helped build these services and applications in an evolutionary architectural style. Sander also discusses why every micro-application and microservices has its own bounded context, and how this domain driven design pattern is essential for enabling these landscapes of small services, of course using many real-life examples. 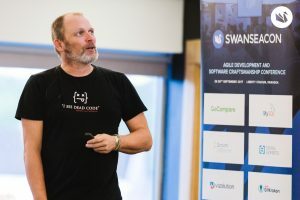 After having coached iterative and agile projects for almost twenty years, author, craftsman and independent consultant Sander Hoogendoorn, looks back on what agile, Scrum, Kanban, XP and other agile approaches have brought us in real-life. 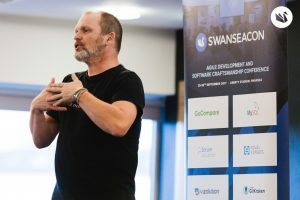 In his well-known, high-speed style Sander will motivate why agile is dead, why you need to stay away from Scrum task-boards, how to stay away from estimates and deadlines, the law of large numbers, how to avoid red sprints, how to put your trust in metrics, how to draw owls, that projects are waste, and most of all that you are not Usain Bolt and last-but-not-least he will explain why you should stop doing projects, but focus on roadmaps and minimal viable projects! After coaching agile for over fifteen years, Sander looks back on what agile and Scrum have brought us in real-life. Sander will motivate why agile is dead, why to stay away from Scrum boards, how to stay out of estimates and deadlines, how to avoid red sprints, how to draw an owl, shows that project managers are not a total waste after all, and that you are not Usain Bolt. This talk has served well as (opening) keynote to quite a number of agile and development conferences.